RAWALPINDI, Dec 22 (APP):Terrorists Friday opened fire from across the border on Frontiers Corps (FC) Khyber Pakhtunkhwa troops busy in construction of new border post at Shunkrai near Pak-Afghan border in Mohmand Agency. 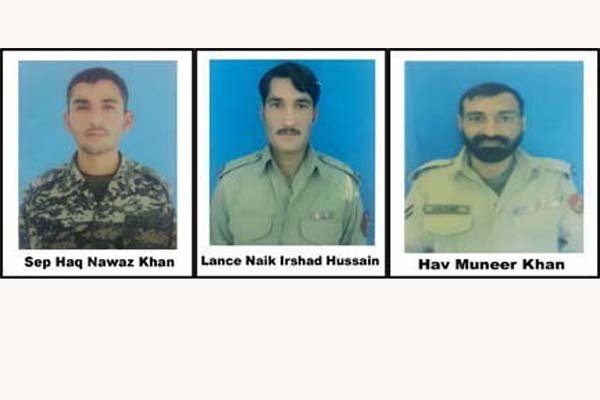 Three FC soldiers namely Havaldar Munir Khan, Lance Naik Irshad Hussain and Sepoy Haq Nawaz Khan embraced Shahdat, an Inter-Services Public Relations press release said. Protection party responded and killed five terrorists while as many were injured. Fleeing terrorists were seen carrying back bodies and injured. Pakistan is paying price of Afghan forces’ lack of capacity and ungoverned spaces on Afghan side of the border.